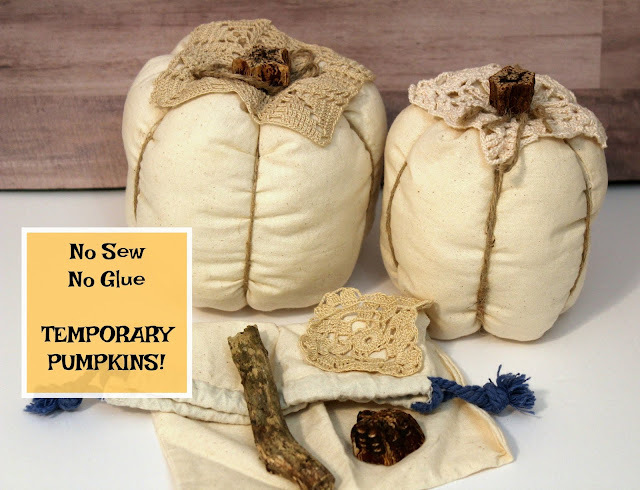 I wanted to make some fabric pumpkins. 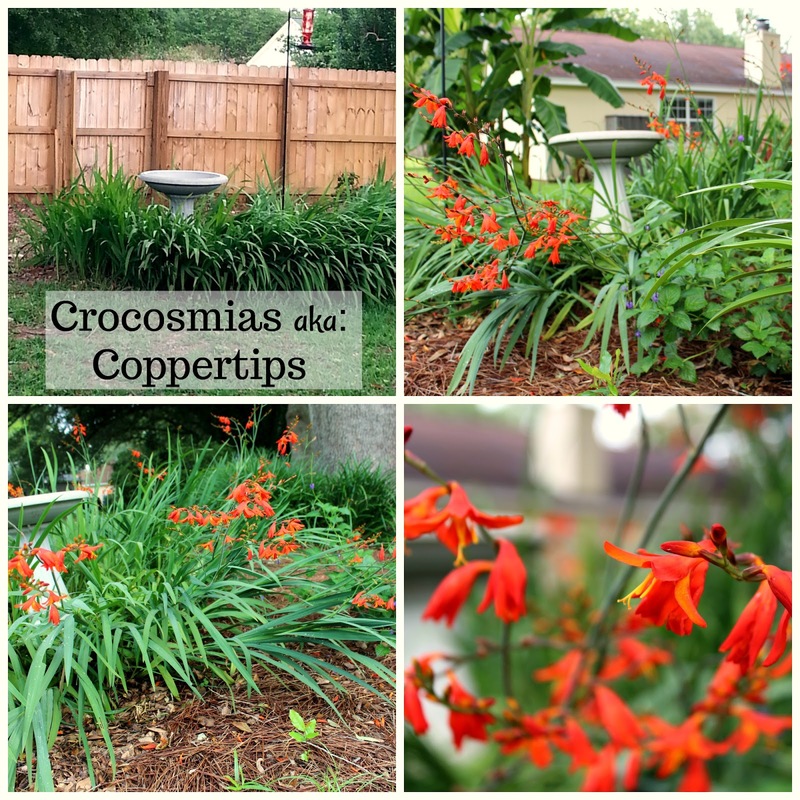 I read many tutorials and blogs on Pinterest that explained many different ways to make them. Some were quick and easy using shirt sleeves and others included sewing or glueing. I didn't want to sew. I didn't have any shirts I wanted to cut up. I looked around for anything that was already sewn, similar to a shirt sleeve. I found some drawstring bags that would work, but I use my bags for many things and I did not want to sew them shut or put any glue on them. So I came up with a way to make TEMPORARY PUMPKINS! I will not need to store them. I can reuse my bags and other items for future projects! If you wan to make some, get creative. Use what you've got. Enjoy your pumpkins and then deconstruct them, if you want. It's that easy! 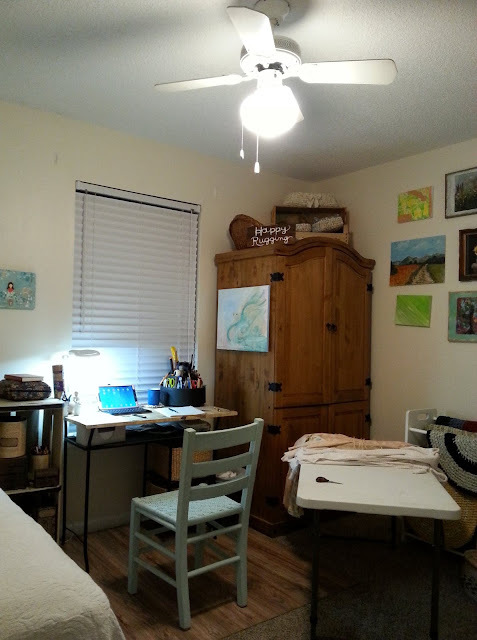 I wanted to share how I got the PERFECT lighting for my craft room. 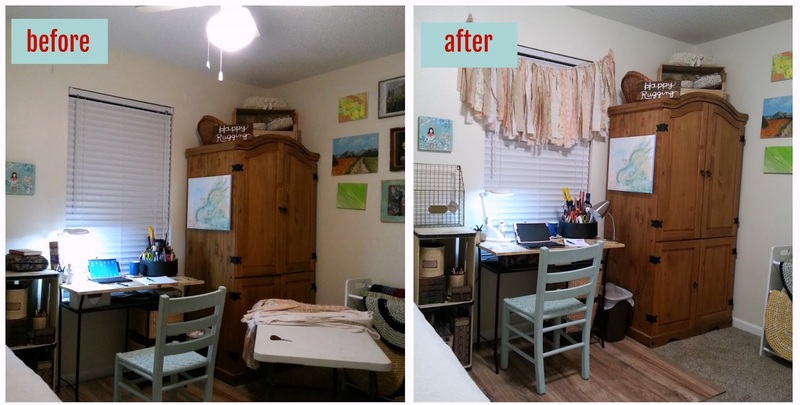 I spent 3 years using horrible lighting in my "Craft Room" when we were in a rental home. It was a small bedroom with a small ceiling fan and simple globe. We changed the light bulb to a higher wattage and took the globe off of light fixture. Then, I used 2-3 lamps around my work space. Not ideal but it helped. One thing I found annoying was the harsh light and the shadows created because we took the globe off of the light fixture, but at least the room was a little brighter. Moving into our home, I found myself with the same issue. I love soft, low light. I always opt for soft white light bulbs, 60 watts. My husband bought daylight bulbs once and I thought I'd die! The whole room looked odd and I could not get used to them. I made him replace them with soft white and asked him to never buy daylight bulbs again. 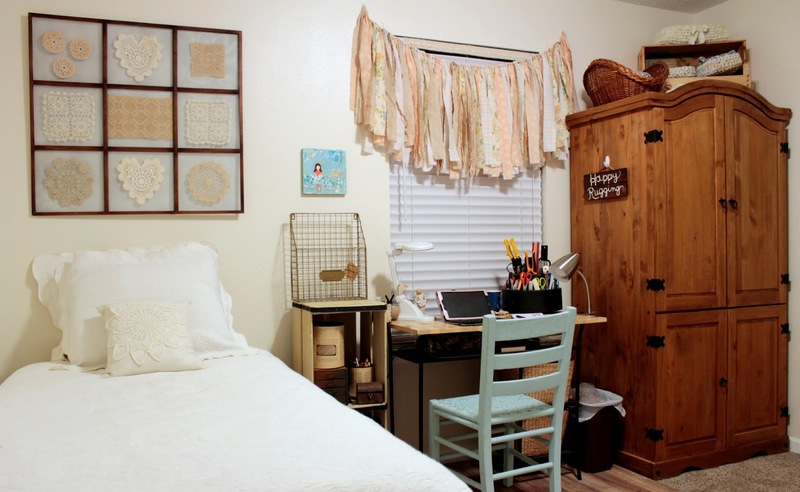 Since we've been in our new house for a few months, and I was ready to finish decorating my craft room, which is again in a small bedroom. In the process, I knew it was time for better lighting. I also knew the ceiling fan had to go. I never use a ceiling fan in my craft room. I asked my followers on my Facebook page and got lots of great suggestions. I researched and learned about CRI (color rendering index) and light temperature. I also learned about lumens. I had several recommendations for the new flush mount LED lights. You can find them at Costco, Lowe's, Home Depot, etc. I really like the look and was seriously considering choosing one of them, but the lumens were too low for the size I needed according to my space, so I hesitated. I thought for sure I was going to have to use daylight bulbs in order to get the correct CRI 90 for color rendering. These are Bright White, not Daylight! Bright White is the mid range between warmer, soft light and daylight bulbs. Knowing I wanted at least 3000 lumens, I decided that what I really needed was a ceiling light fixture that would hold 2 light bulbs. Easier said than done. The LED flushmounts with the bulbs included are very popular. I wanted diffused lighting, with a white glass, not clear or ivory toned. I finally found one at Home Depot, and my husband installed it. 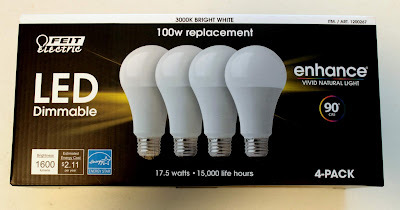 The one I chose actually uses 3 bulbs. I cannot believe the difference! I have a very well lit room, with a warmer than daylight tone that will keep colors accurate for photos. I will also be using some task lighting at my desk, to help offset shadows since my back is towards the light source. It will also help with detail work. I am researching Ott lights. For now, I added a simple clip on desk lamp I found for 25 cents at a yard sale. Couldn't pass that up! While my light was being installed, I finished up a Fabric Scrap Garland for my window, and I moved some things around. 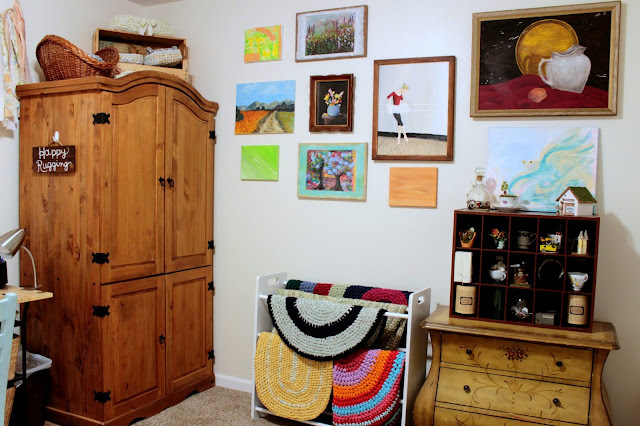 I've been working on a gallery wall, too. I think I'm done for now. Time to get back to rugging! We moved into our home in November, last year. These "grasses" were in our backyard. I thought they were lovely, so I put a birdbath in the center of them. 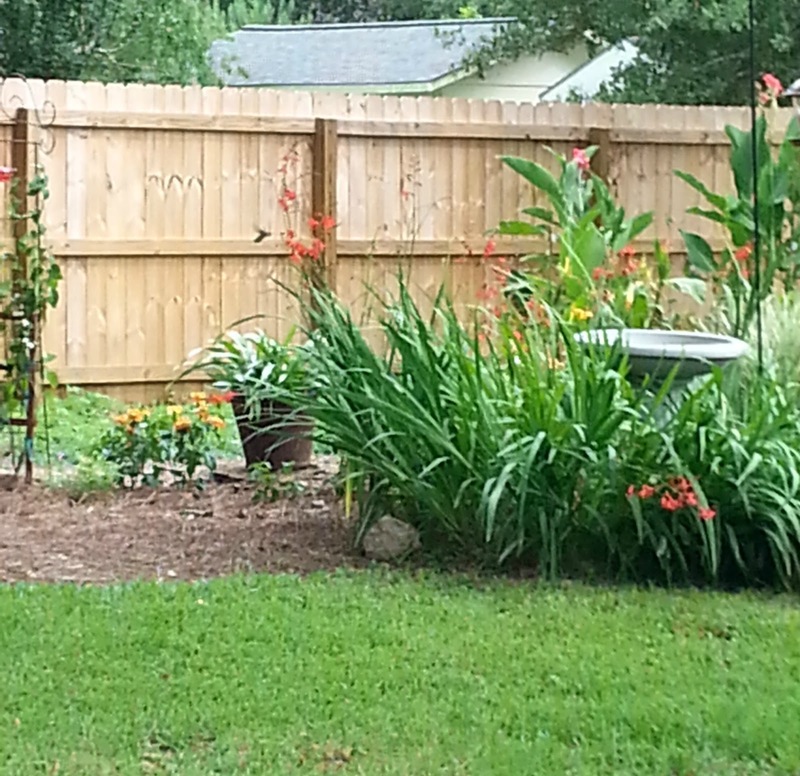 I also put a hummingbird feeder next to the birdbath. In the yard, we had 2 other hummingbird feeders, each of them were different types of feeders. But despite the feeders, NO HUMMINGBIRDS came to our yard. The "grasses" were beginning to grow out of hand. They were spreading and even though they were still pretty, I was just about ready to remove many of them. In fact, I asked my husband to mow them down so I could thin them out easier. Right after I asked him to do it, I walked over to inspect the area and plan where I would begin the thinning out. It was then that I saw several buds forming on stems. I stopped him from mowing just in time. I asked my neighbor if they had ever bloomed before and she said, No. They have NEVER had any sort of bloom. Well, you see. There was a large tree growing directly next to the "grasses". The tree had recently died and turned brown. One of the first projects my husband did after we moved in was to chop the tree down. It seems, with the tree gone, more sun was able to reach them and so...they began to bloom! And they CAME. The hummingbirds came! EVERYDAY they come, several of them. We are so happy we did not cut them down or dig them up. They are not grasses at all. They are CROCOSMIAS also known as Coppertips. This is a lousy phone pic, but can you see the hummingbird? A note about the Coppertips and my yard: They do not get full sun as required, but I live in N. Florida where it gets pretty hot. They receive about 1-2 hours of sun in the morning and dapple sun the rest of the day. They spread like wildfire, some nurseries consider them to be invasive. Personally, I don't think I can get enough now. Hi There! Thanks for visiting my blog. You can subscribe with google, facebook, or simply follow by email. Just click on one of the links below to join. I hope to see you shortly!